Every day, UN police officers work to reinforce and re-establish security by patrolling communities, advising domestic police services, increasing compliance with international human rights standards and restoring and promoting public safety. The United Nations defines “policing” as a function of governance responsible for the prevention, detection and investigation of crime; the protection of persons and property; and the maintenance of public order and safety. What is the mission of UN police? The mission of United Nations Police is to enhance international peace and security by supporting Member States in conflict, post-conflict and other crisis situations to realize effective, efficient, representative, responsive and accountable police services that serve and protect the population. To that end, United Nations police build and support, or, where mandated, act as a substitute or partial substitute for, host-State police capacity to prevent and detect crime, protect life and property and maintain public order and safety in adherence to the rule of law and international human rights law. United Nations police pursue community-oriented and intelligence-led policing approaches to contribute to the protection of civilians and human rights; address, among other things, sexual and gender-based violence, conflict-related sexual violence and serious and organized crime; and conduct investigations, special operations and electoral security (S/2016/952). Policing must be entrusted to civil servants who are members of police or other law enforcement agencies of national, regional or local governments, within a legal framework that is based on the rule of law. Police and law enforcement officials have the obligation to respect and protect human rights (S/2016/952). How does the UN conduct policing? United Nations police officers work in unfamiliar environments and must navigate among the policing approaches of colleagues from about 90 countries. 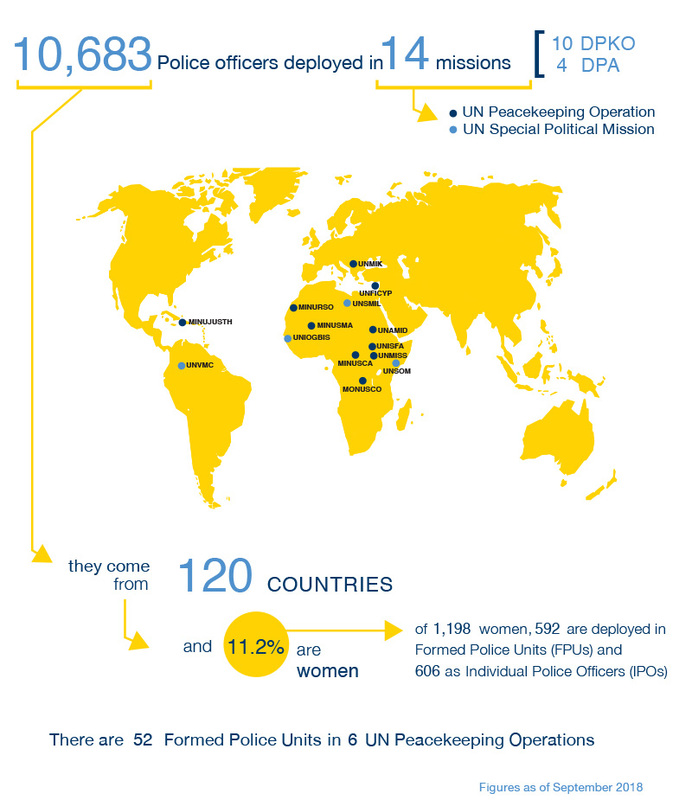 They bring different policing cultures and experience to the job, but are united in the United Nations Police Strategic Guidance Framework for International Police Peacekeeping, the policy foundation for UN policing, which was completed in 2016. It consists of an overarching Policy on UN Police in Peacekeeping Operations and Special Political Missions and, four sets of guidelines on police capacity-building and development, police command, police operations and police administration. Further manuals and training documents will be developed that are in compliance with the tenets of the Strategic Guidance Framework. The framework assists UN Police in developing specialised job descriptions to recruit the right type of personnel for field missions, and enhances the effectiveness of pre-deployment and in-mission training. All UN police training materials developed after the completion of the Strategic Guidance Framework for Police Peacekeeping are incorporating its guidance.